I was totally unaware that there would be a total solar eclipse until I saw this review opportunity. The girls and I have been making a list of cheap or free things to do over summer vacation and this won a spot on the list of things to do. 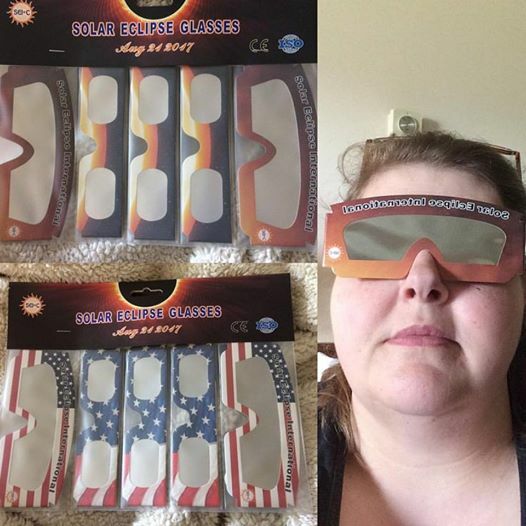 Now you have to remember you can not look at the eclipse without protection so make sure to you grab a pair of ISO certified solar viewing glasses like these from WEBSUN. They come in a 10 pack 5 in one design and 5 in another. Great for family viewing or if you are having friends over. Great for the child or adult who loves the universe or just interested in Science. There are several sites up that will talk you through the Total Solar Eclipse which will be on August 21, 2017. Grab yours now so you have them in plenty of time. The WEBSUN ISO certified solar viewing glasses can be found on my affiliate link below.